Is the Lemp mansion in St. Louis, Missouri haunted? The Lemp mansion was built in 1868 by St. Louis Jacob Feickert. William J. Lemp and his wife, Julia, moved into it in 1876. In 1911, the house underwent major renovations including conversion of some space into offices for the Lemp Brewery. The Lemps lived in the house until 1949 when Charles Lemp committed suicide. In 1950, the mansion became a boarding house; throughout the next decade, it lost much of its ornate charm. The construction of Interstate 55 during the 1960s led to the destruction of much of the grounds and one of the carriage houses. 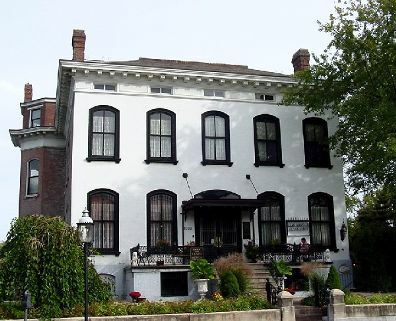 The current owners, the Pointer family, purchased the house in 1975 and have since renovated much of it as the Lemp Mansion Restaurant and Inn. The Mansion is alleged to be one of the nation's most haunted buildings. In the 1980s, it was ranked in the top nine haunted places by Life Magazine. There have been four confirmed suicides at the mansion and reputed paranormal incidents include doors opening, shutting, locking, and unlocking on their own; candles lighting on their own; and a glass flying off a bar and crashing to the floor. Visitors to the mansion have reported feeling as if they are being watched, or sensing an atmosphere of sadness, and some claim to have seen apparitions of members of the Lemp family. One report says that, during the mansion's restoration, a painter working on a mural felt that he was being watched and immediately fled the mansion, without washing his brushes or taking out his equipment, and never returned. Various groups have held seances in the mansion, and reported that most of the paranormal activity is related to the ghost of Charles Lemp. Ghosts of other family members, including Lillian (the Lavender Lady), have also reportedly been seen.